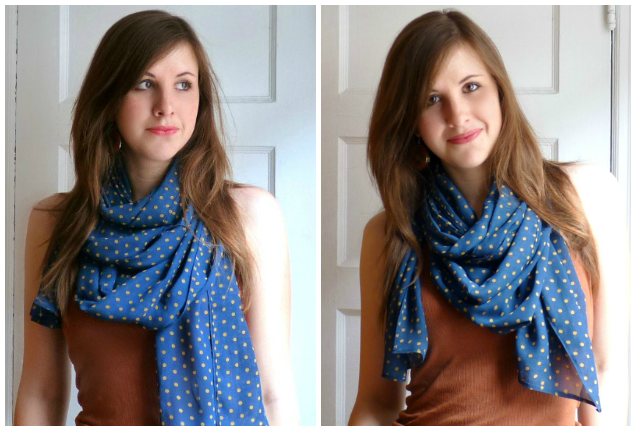 Hey y'all, have you seen my mug elsewhere in the sewing blogoverse today? If you follow Cation Designs -- and you should -- then maybe you witnessed me taking over her blog today while she's off traipsing around with the Euro types. 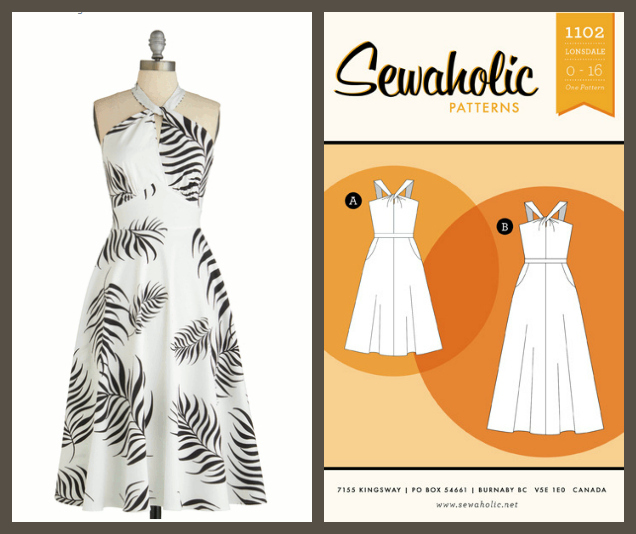 In my guest post I give some tips and tricks on how to sew with chiffon, our notorious fabric nemesis. These are sewasaurus tips, you see, but hopefully they're helpful nonetheless! I was able to cut, sew and narrow-hem the above scarf without taking any casualties, so maybe that says something. 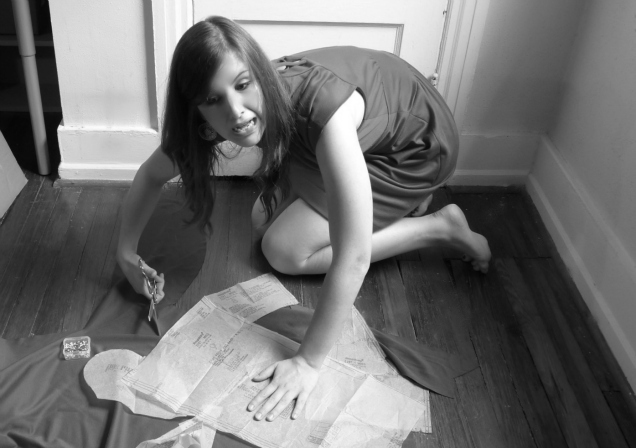 Go forth and sew yer chiffon. That's right. I bought an upright ironing board AND a counter-height cutting table. I now have my own sewing room (!!) and I finally live close enough to an IKEA (!? ), so I've been shoppin' til I'm droppin'. For the past year I've used a godawful tabletop ironing board for all my pressing. It had awkward little obtrusive legs so I couldn't even drape a pant leg over the edge to iron one layer at a time, and the board was so lightweight that I had to practically chase it around the room as it scooted away from me. My last apartment was tiny and I used my dining table for my sewing machines, and my floor as my place for ironing and cutting. Another solid color knit dress?! Get outta town. This one is Simplicity 2281, a Cynthia Rowley design from last year I guess. I'm trying to sew through my pattern stash and I'm down to the last dozen or so that I haven't touched at all. This is mostly because JoAnn's is now quite far away from me, which could be a good thing, but it means that I've resorted to sewing up patterns I'm not that excited about. I still have a grudge against Cynthia from when she was a guest judge on Project Runway All Stars and made Mondo cry. This may have colored my judgment of her pattern line as a whole. grl, DON'T mess with Mondo. I made View A, the one without the alien wings. Long story short (yeah right): I do not like this pattern that much. I was worried about those sticky-outty tucked sleeves on my broad shoulders from the get-go, and I should have trusted my instincts. My heart-shaped face needs a lower neckline than this. Also, gathers? I decided awhile ago to stop making stuff with gathers, but I guess I forgot because this dress is chock full of them. It's just so, youthful. And it's a tad too big. I should know by now: save the side seams for last so it's easier to adjust later. I wasn't sure how to do that with the full bodice/waist lining, though, and I always get nervous steering away from the instructions because I've made mistakes when I assumed I was smarter than the patternmaker. I ain't. Can't even use a belt, the waistband's so wide. In the pattern's defense, I think I used the wrong fabric... I made it out of ponteroma knit, which is pretty thick and stable. This dress has a fully lined bodice and waistband, so the end result is really heavy. Knit dresses don't need linings, but I wasn't sure how else to finish the bodice and the back keyhole thing. Ugh. Homemade, much? Don't make gathered skirts or neck bows in thick fabric. Seriously now. It looks like a pastrami sandwich. Thank goodness I recently bought a walking foot. The thing about sewing... you have to make the whole damn thing before you can determine whether you even like it. Luckily this one didn't take too long (no zip) and the fabric was inexpensive, so it's not like I regretted skipping a muslin. Towards the end I was skeptical but thought that it would look better once hemmed. I still wasn't thrilled, but I finished it all up anyway because I know I'll wear it in fall, layered under jackets and scarves. I do like the color and it's certainly comfortable (duh). Anyway, I'm sorry this is the second post in a row where I've whined about my finished item. I should plan my next project more carefully so it'll be something I (and you) absolutely love. I think I will ditch the pattern-stash-bust idea and splurge on a rad new pattern. But what?! Should I wait for Colette to release their fall line in a couple weeks (yay)? 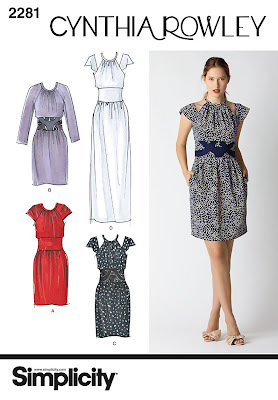 I have noticed that almost all of the Make This Look pattern recommendations are commercial patterns, though there's an exception or two (see here). Anyway, when I was on ModCloth the other day I kept discovering items that looked an awful lot like some of our favorite independent pattern designs. I thought some of the similar ones were worth sharing. Disclaimer: I'm not in any way accusing anyone of copying designs. Not sure how that'd happen in these cases anyway, and it's nearly impossible to draw that line when it comes to fashion. I just found this interesting! 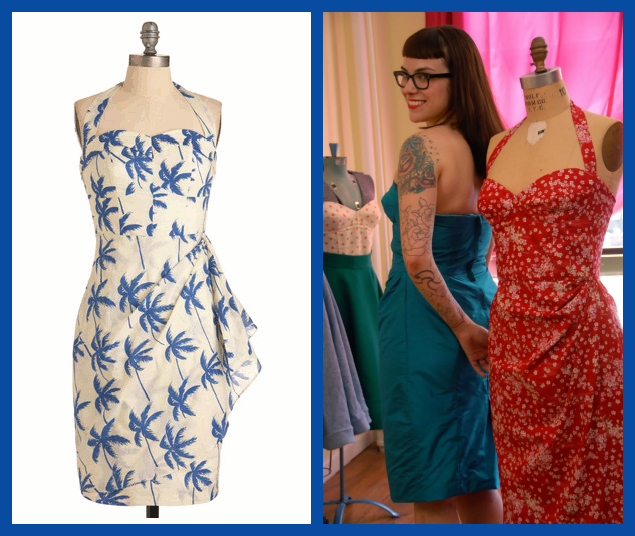 The Frond Bombshell ($190, yikeys) is eerily similar to the Lonsdale dress pattern by Sewaholic, even the tea length of the skirt. The ModCloth design is actually a halter, though, while the Lonsdale has straight straps that connect to the back bodice. I think the Lonsdale is well-suited for a large-scale graphic print like this one. The Palm of Your Hand dress ($115) reminded me of a slightly more conservative version of the popular bombshell dress from Gertie's online course on Craftsy. 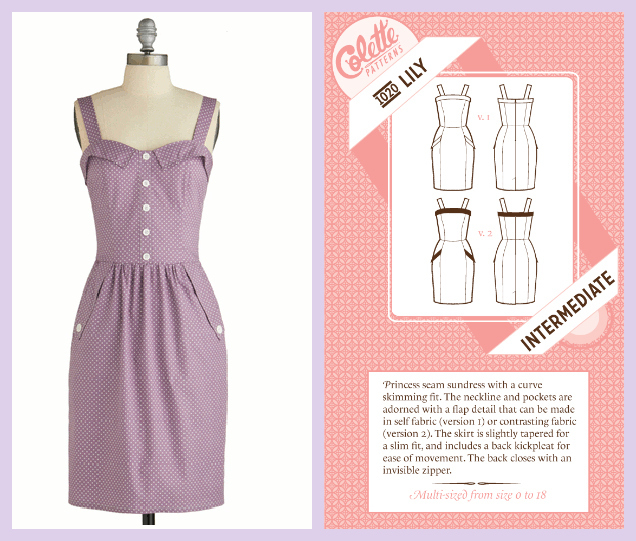 Gertie's dress has a lower neckline and a zip back, while ModCloth's has elastic shirring in the back. The shape of the Catalogue Your Dots ($143) dress is similar to the Lily dress from Colette's Spring/Summer 2012 pattern line. Obviously there are differences in the collar and gathering of the skirt. I kinda like the idea of adding buttons to the front of a Lily. You know, I'm really struggling with the fact that the ModCloth dress is $142.99. It's 100% cotton and unlined... Just, why? Duh. This is the first dress I saw that made me go, wait - I know that pattern... 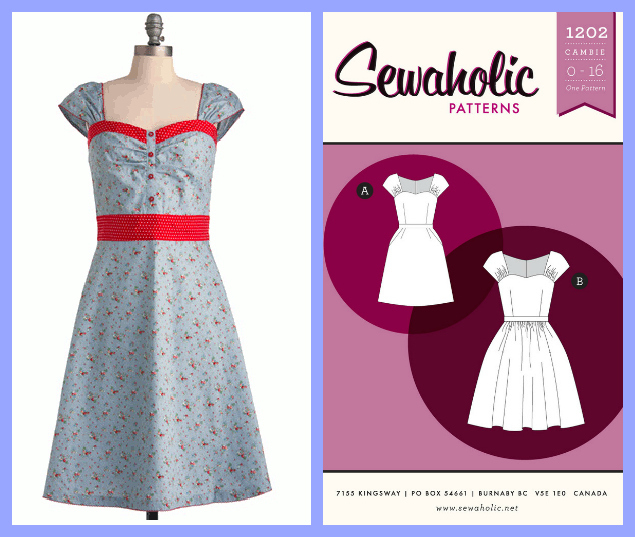 The Strawberry Cobbler dress ($65) is a nearly dead ringer for a Cambie dress pattern by Sewaholic, except how the bodice is shaped by gathers instead of darts. ModCloth's has an open upper back, too. I don't know if I could handle a Cambie so sickeningly sweet as it is in this fabric, but I'm down with the idea of using contrasting fabric as an accent. It's kinda hard to tell in this (questionable) print, but the Dandelion Around skirt ($35) resembles Megan Nielsen's new Kelly Skirt pattern. Two buttons on the wide waistband, two pleats in the same place, but in-seam instead of scoop pockets (and a weird long underlayer?). I still want a Kelly skirt in a print, like Roobeedoo's. Uh, can I get a whoa. 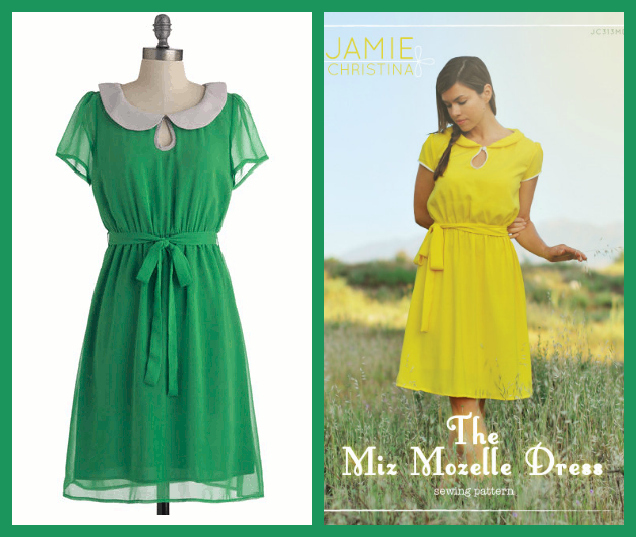 The Behold the Emerald Dress ($50) is crazy close to the Miz Mozelle dress pattern by Jamie Christina. That green color is beautiful. I might want this pattern now. 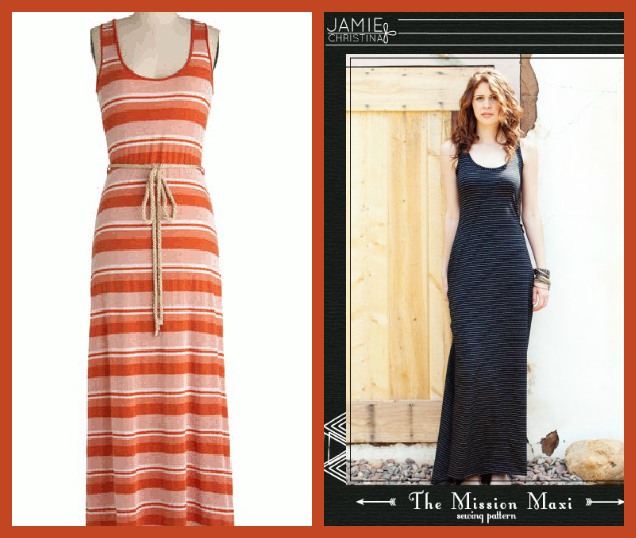 Speaking of Jamie Christina, this Dockside Date knit maxi dress ($53) is just like her ever-popular Mission Maxi pattern. Even has a racerback, though more pronounced. After I made this connection, I saw the ModCloth version on A Beautiful Mess, worn by Elsie (here). Dear ModCloth, I'm a blogger, too. Can you send me free clothes? Eh, whatever, I'll just sew them. You'd think that seeing all these similarities in the RTW world would make me inclined to shrug and say, "Why sew it when I can just buy it?" Somehow, though, it affirms my love of sewing, and makes me proud that I could reproduce these good-looking garments in my own home. Plus - seeing the original price$ of the ModCloth dre$$e$ make$ me really motivated to keep $ewing my own $tuff. Seen any independent design lookalikes in the RTW world lately? I'm curious - Does it make you pleased that you have the option to sew similar designs yourself, or does it discourage you from sewing in any way? This past winter, I initially "signed up for" Scruffy Badger's New Look 6000 Frock Fest. I couldn't make time to buy the fabric and sew up the pattern, though, so I gave up and ducked out sheepishly (or, duckishly). Blogging-related guilt is one of the strangest types of guilt. Maybe I'll do a sociological analysis of this. Hm no. Anyway, here's my stab at the New Look 6000 frock, beyond late to the fest. I know, I know. Something's... off. Can you spot it? It's not the fact that I haven't mastered the sad-60s-secretary pout that this model has. It's that my side pleats lay on the right side of my body, instead of the left side where they're supposed to be. Meh. No parents, no rules. This is an easy mistake because the whole front is just one weird accordion-looking piece, and as someone who's sewn from several dozens of patterns in my life, I automatically placed the pattern piece to cut on the wrong side of the fabric. Oops. Wrong side. This is a risky pattern for me. Shift dresses make me self conscious, and even in a double knit this required a lot of tweaking on fit: take in a thousand inches around the waist and lower back, let out a thousand inches in the hips. Luckily the center back seam and darts help with adjustments like that. And yet, the fabric still drags and pulls in mysterious ways. As for the front, it's unfortunate that the pattern has no way to help shape the side opposite all those pleats. On my initial fitting, it drooped sadly on my left half so I made the pleats deeper and longer to take in some of the extra fabric. It worked okay. Overall, I feel fine about this dress but I actually doubt I'll wear it that often. It's not, uh, something I'd wear out with my peers or anything. Luckily it didn't take too long because I used a Ponteroma knit and omitted the zipper and back vent. I jumped into this project quickly because I'm starting a new job this coming week (in my new city!) and I wanted some more "business casual" attire. But maybe wearing a figure-hugging armadillo dress with little chicken wing sleeve cuffs isn't the best first impression. How many animal names have I mentioned in this blog post? 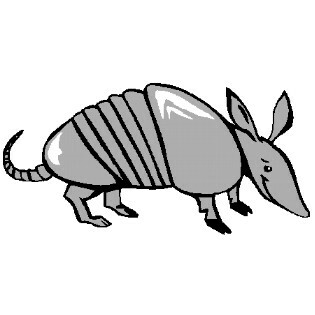 Badger, sheep, duck, armadillo, chicken. Five. Do any of you have suggestions or recommendations for other office-appropriate dress patterns that don't feature shark gills? 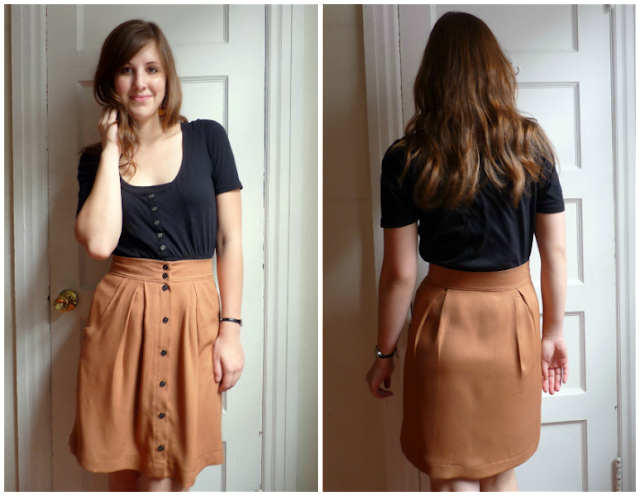 I was a lucky tester for Megan Nielsen's newest pattern, the Kelly Skirt, and now that she's released it into the wild (see here) I thought I should share my creations. Plural. In all, I've made this skirt three times. It's that easy and fills a lot of gaps in the wardrobe. Button-down skirts simply don’t exist in the commercial pattern world, it seems. I would go ahead and tell you how many straight skirts with a side zipper there are between Simplicity and McCalls, but I’m not sure I could count that high. For independent designs, there’s just the Colette Beignet, the Wiksten Tulip (wait -- it's not in her shop; is it no longer available? ), and now the Megan Nielsen Kelly. I think the Kelly fits in nicely with the competition. It’s high-waisted with a thick waistband, deep hem and pleats for shaping. Can’t resist the scoop pockets on the front. 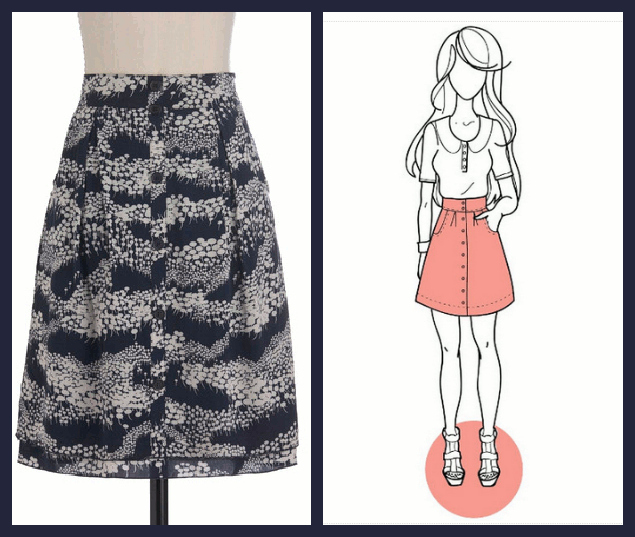 The fabric recommendations for this skirt are midweight wovens, like denim, corduroy and linen. I used cotton sateen on my tester version, a linen/cotton blend on my second version and rayon challis for my third. Yea, by the third skirt I strayed away from the rules like the reckless sewasaurus I am, but I think a light and breezy fabric works quite well with this design, if you’re looking for more drape and a less-pronounced A-line shape. This one was made with Robert Kaufman yarn-dyed Essex linen I found on Fabricworm. The vertical threads are dyed black and the horizontal are white, which gives an overall effect of textured heather gray. It’s 55% flax linen/45% cotton so it claimed it wouldn’t wrinkle as easily as pure linen. Ahem. Because I didn’t have a washer and dryer at the time, I hand-washed and hung this fabric to dry. 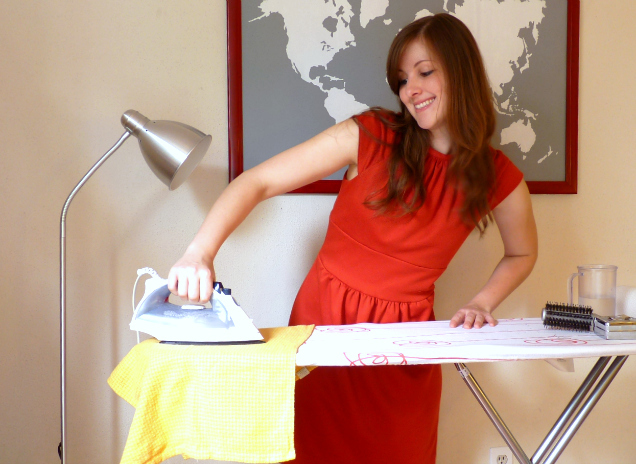 Unfortunately the wrinkles from washing, rinsing and wringing seem permanently set in no matter how vigorously I iron. Life goes on, clothes wrinkle on. I added some piping (without the… pipe) to the pocket edges just for fun. This fabric is quite scratchy, so I underlined the whole skirt in Bemberg rayon. Bright red, o’ course. If you underline yours, make sure you pleat the layers separately. I tried pleating them together to save time, but that made for some large puffy pleats -- not cute. My latest Kelly version was made in a tobacco-colored rayon challis from ye olde JoAnn. Being a semi-pro at the Kelly by the point, and not having to add an underlining, I whipped this up in what seemed like no time. This pattern is designated as "beginner" level and I stand by it. My machine ACTUALLY cooperated, too, and allowed me to make buttonholes without provoking a wrestling match like it usually does. I think the pattern calls for seven buttons total but I used eight on both of these versions. Do you think Kelly Kapowski would ever wear a Kelly skirt? Or is she more of a neon mini-skirt and pastel floral pants kind of girl? To each her own. So tell me... is the Kelly skirt in your sewing future? Hey, I made shoes! Kinda. Check it out... I have a guest post on Megan Ta Da today, sharing a tutorial on how to make some summer slippers. Megan's a sewing/art/travel/awesome blogger who's currently studying art in a stone village in the south of France for the summer. Boring, right? Because of the theme of her blog, I wanted to incorporate my own travel memories into my sewing, so I made some Japanese-inspired house shoes. Japan's the only foreign country off North America I've visited, actually. Seems like I need to cross the sea more, but why leave my home when I can putter around in these cute slippers all day? See the post here to learn how to make your own! Is your home a shoes-off zone?